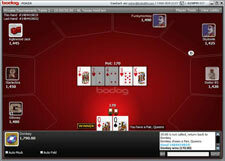 Bovada was developed by Bodog and opened on December 14, 2011. Bovada is now the US version of Bodog and they are now redirecting all the US Bodog traffic to Bovada. The Poker games and tournaments combine Bovada and Bodog players, so the only real difference is the name. Also the poker software is identical, just a new name. Bovada (formerly Bodog) is the new US arm of the Bodog online gaming empire, and while the name may have changed the software, strict licensing and regulatory body, and access to the entire Bodog Poker network remains intact. The change was made to separate the Bodog name from the US market in the aftermath of Black Friday, which will now be handled by the Bovada.lv website. Bovada is one of the few remaining online poker sites still operating in the US, and unlike every one of their competitors, Bovada (then operating as Bodog) took on the US Government in court and WON a few years ago! This has made Bovada, and its parent company of Bodog, one of the safest online poker rooms for US players, since the US government knows Bodog will fight back against their allegations. Anyone who has spent even a little bit of time at the Bodog (now Bovada) poker tables knows the competition is by far some of the weakest in the entire online poker industry, with the vast majority of their player base coming from the sportsbook arm of the site. Most of the poker players at Bovada are extremely soft, some with no poker experience whatsoever. Additionally, Bovada prides itself on keeping the sharks away, and making the recreational players comfortable. The site has taken this farther than any other online poker provider by making all of their tables completely anonymous, thwarting all attempts at data-mining. The Bovada poker software has come a long way since the early days of Bodog, and now is on par with the rest of their competitors in the online poker market. With added multi-tabling capability, and a sleek new design, the Bovada software will quickly become one of your favorites of all-time. As I mentioned above, Bovada is also the only poker site in the world that offers Anonymous Tables for 100% of their games. This along with increased multi-tabling, resizable tables, and their new filter and search features has made Bovada’s software one of the strongest in the online poker world. Bovada is currently offering all new, real-money players at the site an exclusive 100% deposit bonus up to a maximum f $1,000. This exclusive Bovada deposit bonus is one of the best online poker deposit bonuses available. In addition to the incredible welcome bonus being offered at Bovada, players will also be eligible to play in the weekly $100k guaranteed tournament, one of the largest weekly tournaments in online poker, as well as taking part in the site’s Royal Flush and Bad Beat Jackpots. Bovada is also offering their poker players entry into the Bovada loyalty program which allows players to accumulate player points that can be exchanged for cash, merchandise or tournament tickets. With online poker legislation constantly being updated, and with Bovada being a US poker room, it’s a good idea to check and see what deposit methods are available based on your state and region before choosing a deposit method.